Injecting NPR's Vaccine Coverage With Respect — And Facts : NPR Public Editor Journalists are grappling with how to include diverse perspectives, without spreading misinformation. MMR vaccine being drawn into a syringe. 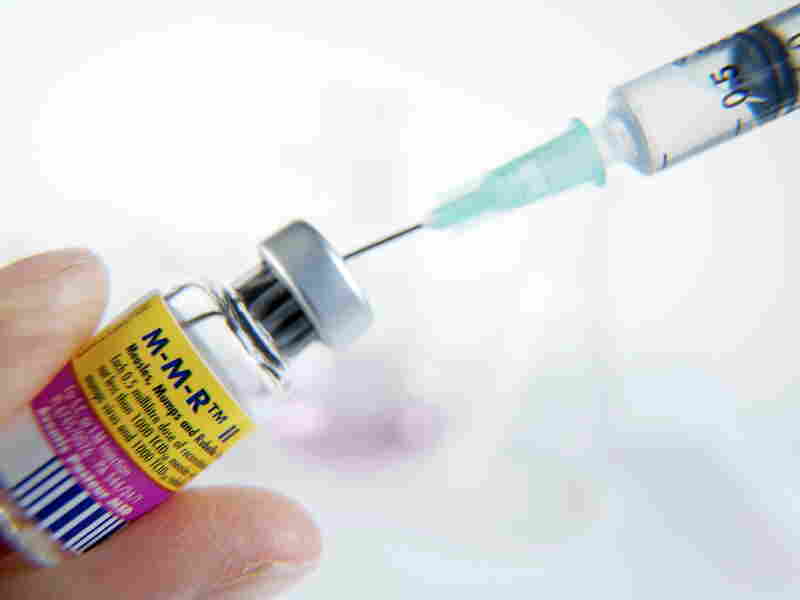 This combined vaccine protects children from three viral diseases: measles, mumps and rubella. Conscientious journalists try to avoid engaging in false equivalence and spreading misinformation while doing so. They also try to tell stories fully, respectfully presenting multiple perspectives on the facts — facts being the baseline of all reporting — so listeners can make up their own minds. They also try to hear directly from the people they are reporting about. The recent U.S. measles outbreak has offered a challenge to those journalists who want to stay true to all these guiding principles while covering the story, a major aspect of which includes the contributing role of parents who don't vaccinate their children. The outbreak has been particularly acute in pockets of New York and the Washington/Oregon border. Washington state officials declared a state of emergency. As NPR reported, "Vaccination rates in the Pacific Northwest are among the lowest in the nation." To cover the story, NPR has talked to health officials. It has also put a particular focus on the underlying resistance to vaccinations that officials say is allowing the outbreak to spread. To cite a sampling of that coverage, Weekend Edition Saturday interviewed Ethan Lindenberger, an 18-year-old Ohioan who got vaccinated over his mother's objection. All Things Considered interviewed a medical anthropologist who has studied how vaccine resistance spreads. (She expressed concerns about media coverage that, she said, vilifies parents who decide not to vaccinate.) That newsmagazine also carried a report about a South Carolina woman who is trying to educate fellow parents about the need for vaccinations. Taken as a whole I find no false equivalency. (More on that later.) Put another way, the coverage has stuck to the facts: As multiple studies have shown, there is no link between childhood vaccinations and autism, one of the main fears cited by parents who choose to opt out of vaccinations. But that one-sided coverage has upset dozens of listeners who have contacted my office and NPR to complain that the coverage has fallen short of NPR standards. To cite one listener: "I thought I could COUNT ON NPR to cover multiple sides of a controversial issue, as, for example, I have heard you do on gun control (vs. gun advocates), and questions of immigration, where your journalists have spoken to people on BOTH sides of an issue/stance." She went on to request that NPR interview "some of the calm, cogent, informed, well-researched and well-spoken representatives of those who choose NOT to vaccinate." There are many, with many reasons for not vaccinating, she wrote. Journalists are wrestling with this issue, as well. As newsroom employees at member station KUOW in Seattle told me this week, they are grappling with how to hear from parents who are hesitant to vaccinate — and not just talk ABOUT them — without further spreading misinformation. That's a particularly acute question in a place where up to three-fourths of kindergarteners in some school districts do not have all of their required vaccinations. When it comes to vaccines, the widespread misinformation is breathtaking and skirts the facts. In addition, such claims often rely on arguments about "individual rights" and "personal choice," as if the choice not to vaccinate an individual child has no consequences for the broader community. I read through all of the emails that NPR received on this topic and they are full of falsehoods; anecdotes that are not supported by the science or any proven evidence; facts that are indeed true but are conflated in a way that misrepresents the risk; and facts that are unrelated to the issue completely. The impassioned listener quoted above, for example, cited "responsible" parents who keep their un-vaccinated kids home when they are sick. But that would not help stem an outbreak of measles, which can be spread by an infected child for four days before symptoms appear. Another listener wrote to express frustration with what he called NPR's "binary narrative of for-or-against." He said he wanted NPR to closely examine several of the arguments cited by those who are concerned, arguing, "if the vaccine skepticism is in fact wrong, then bring it to the fore so that it can be refuted." Again, that's tricky to do without spreading misinformation, and his story ideas were largely about vaccine ingredients and questions about pharmaceutical companies. Those questions are indeed cited by those who choose not to vaccinate — and are potentially good topics for stories — but they do not at all address the scientific consensus that says childhood vaccines are safe. Other questions he cited have been addressed earlier by NPR, although the reports are not easy to find. The bottom line for me: I think NPR's current coverage has been responsible, even if it sometimes goes against the principle of reporting a wide range of voices. I do have a few thoughts about how the coverage could be strengthened. For example, an on-air story about Arizona lawmakers who are considering loosening the exemptions for vaccines started out with the voice of a representative of a group that advocates against mandatory vaccinations, followed by that of the sponsor of the bills. The voices of physicians and others with accurate information about the science only came afterward. But what if NPR had employed what's known as a "truth sandwich" in this story? That's where incorrect information is sandwiched between the accurate facts. So the report would have started and ended with the facts about vaccinations. That's also a technique journalists could use if they do decide to talk to those who are on the fence about vaccines or to explore some of the arguments used by vaccination opponents. Another thought: NPR has referred several times in the past year to "anti-vaxxers," which one letter-writer called a "disrespectful label." If journalists want a wide audience to hear their reports, "vaccine-hesitant" is considered less polarizing (and "vaccine-resistant" would be even more direct), and also acknowledges that some parents are on the fence about their decisions, not adamantly opposed to vaccines. "Terms like 'vaccine hesitant' can accurately describe an individual's position without carrying the pejorative weight of 'anti-vaxxer.' But when it comes to characterizing the various groups that are promoting misleading misinformation about the safety of vaccines, we have struggled to find language that is precise. Recently, for example, some groups have started emphasizing that they are not opposed to all vaccination, only the mandatory aspect. But their websites are filled with misinformation about safety that can lead someone to be opposed to all vaccination, which can put individual children, vulnerable adults and entire communities at risk. Do we call this group an 'anti-vaccine' group against their wishes and simply say they are 'opposed to mandatory vaccination?' We did this recently but in retrospect it seems insufficient. We continue to search for the best and most neutral ways to represent the full spectrum of positions of those who are questioning vaccines, while reporting on the false aspects of their arguments." Finally, a periodic reminder: Kaiser Health News, with which NPR has collaborated on many of its vaccine and measles stories, is an editorially independent nonprofit news service that is part of the Kaiser Family Foundation. As KFF says on its website: "It is not associated with Kaiser Permanente," the health care provider; some listeners have mistakenly thought there was a connection.